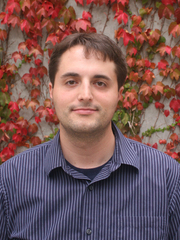 Adam J. Engler is a professor of Bioengineering at UC San Diego. His research focus is stem cell research, with an emphasis on how adult and embryonic stem cell differentiation is controlled by the extracellular matrix. Engler earned his B.S.E. degree in bioengineering at the University of Pennsylvania, and a Ph.D. in mechanical engineering and applied mechanics. Engler then moved to Princeton University’s Department of Molecular Biology as a Postdoctoral Research Fellow, funded by the National Cancer Institute. Dr. Engler is the 2008 recipient of the Rupert Timpl and Rita Schaffer Young Investigator Awards from the International Society for Matrix Biology and the Biomedical Engineering Society, respectively, for his lab’s work on the mechanical regulation of stem cell differentiation by the extracellular matrix.